2014 is a crucial year for our country. This fall the American people will go to the polls and choose between two vastly different visions for the future. What the left offers is more of the same: managed decline and the further Europeanization of our country. Conservatives have a bold agenda that would restore economic vitality, renew the American Dream, and equip people to achieve happiness and prosperity. We’re highlighting that agenda on Monday, February 10th. Former Senator Jim DeMint, Representative Matt Salmon, Representative Jim Jordan, Senator Ted Cruz, Representatives Tom Price and Phil Roe, Representative Jeb Hensarling, Representative Tom Graves, Senator Tim Scott, Representative Raul Labrador, Senator Mike Lee. Download complete agenda. Conservatives must lead through action. And we are. Heritage Action is bringing these leaders together on February 10. The Conservative Policy Summit highlights the bills they have introduced, showing Americans the winning conservative reform agenda. 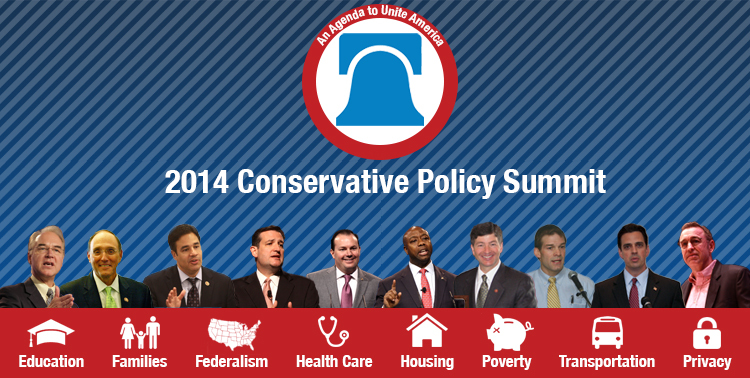 You are invited to watch the Conservative Policy Summit live. Go to this page on Monday, February 10th: Heritage Action Policy Summit. If you’d like a reminder, sign up HERE, and we’ll send you an email when things get started. This entry was posted in 2014 Elections, 2016 Elections, Constitution, Economy, Major News Items, National, Tea Party, Unalienable Rights and tagged Heritage, Heritage Action, Heritage Action Policy Summit, Jim DeMiny, Mike Lee, Ted Cruz. Bookmark the permalink.